Two brews, two blocked boiler taps, is not a record I want to keep in the future! The time had come to replace the standard taps on my boilers, and to fit a decent hop-filter in the main boiler while I was at it. 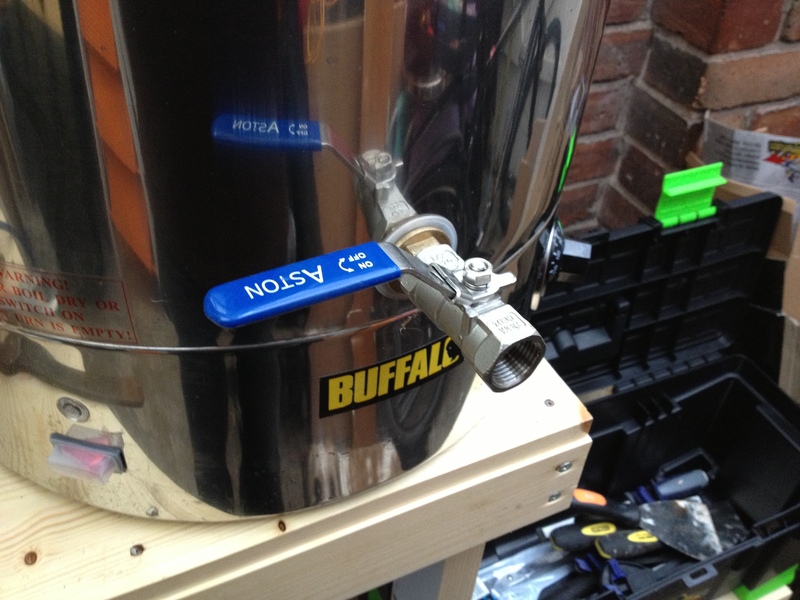 Before I started fiddling around with my two £90 bits of shiny stainless steel I searched the home-brewing forums for an idiots guide but couldn’t really find a conclusive post, with pictures, to guide a novice DIY-er like myself. 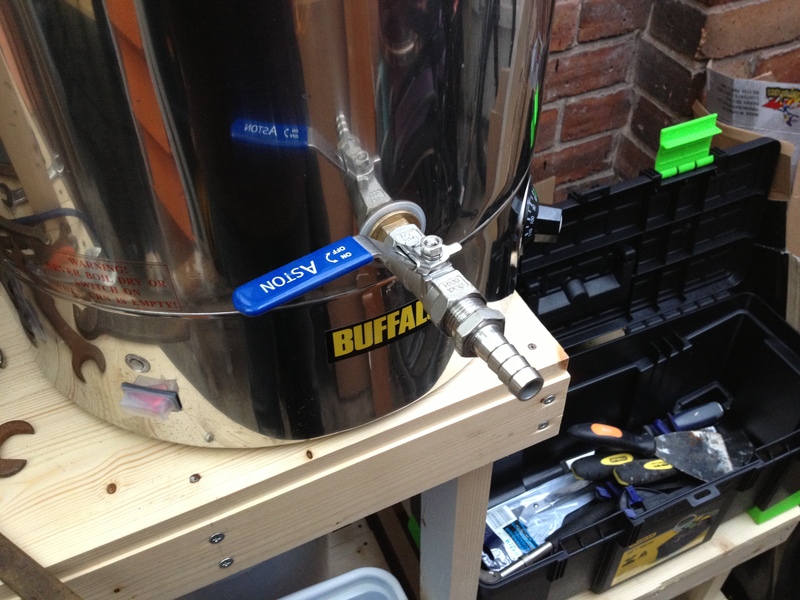 Hopefully this write up of my experiences will go some way to helping other brewers take the plunge in modifying their kit too! 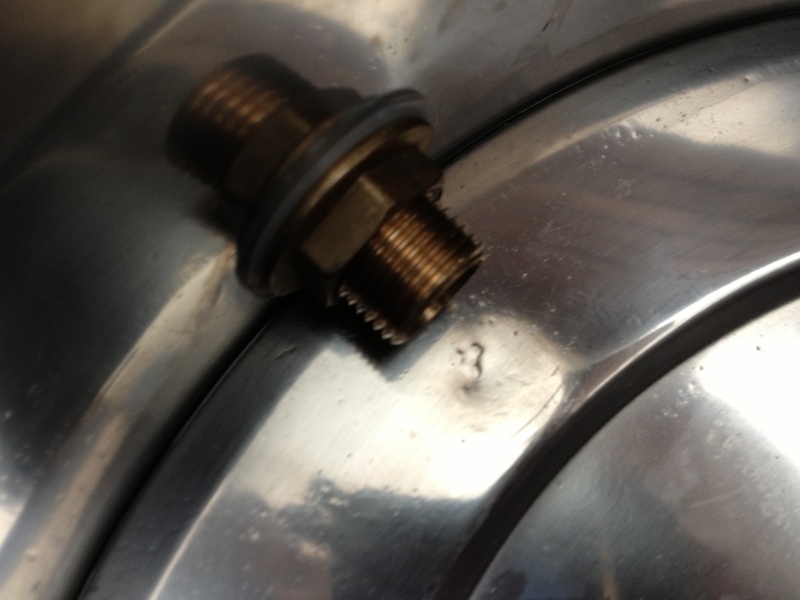 First steps: Remove the standard tap, this is only hand tight and can just be unscrewed and removed. 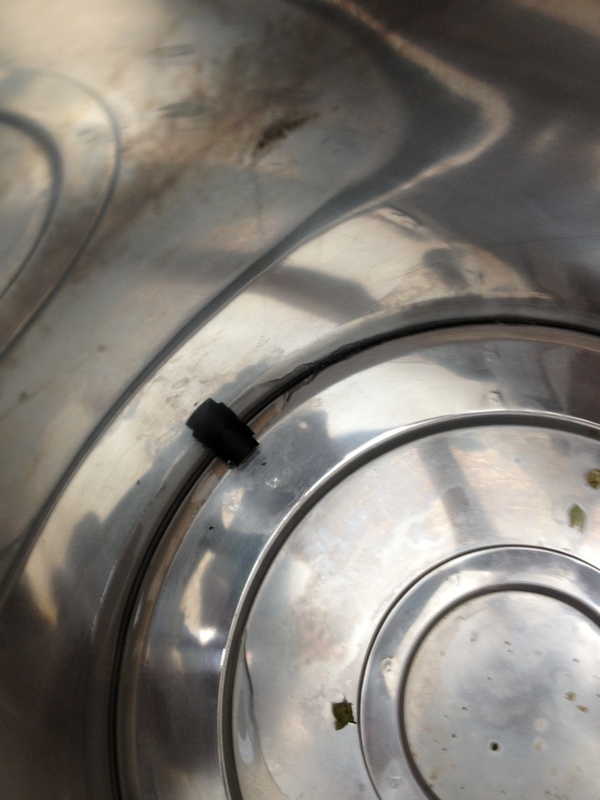 Once removed I needed to enlarge the hole in the boiler to 20mm (from c. 16mm) – this is done using a 20mm QMax cutter. As you can see this little metal punch is screwed on to the existing hole, and when tightened using an Allen key it punches a clean hole through the stainless steel. 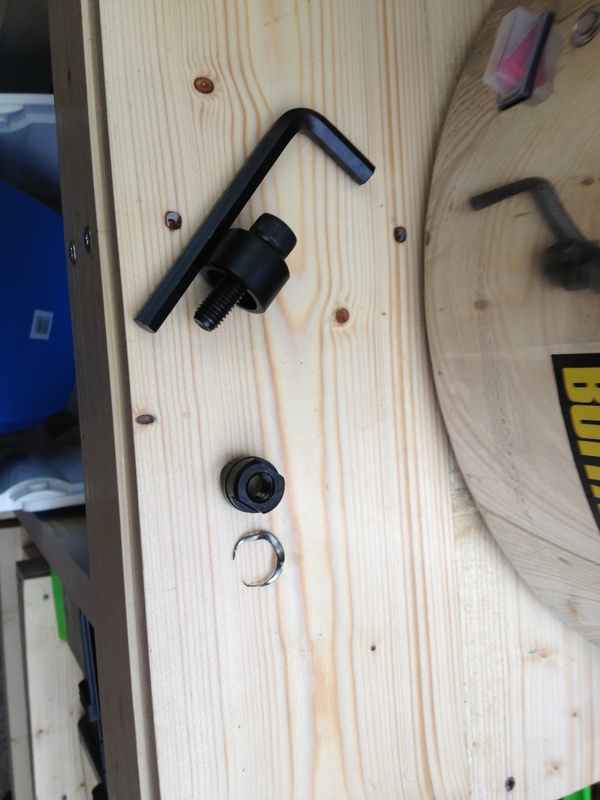 You can see in the third picture the tiny sliver of metal removed – this wasn’t cut centrally on purpose as I needed to slightly raise the hole height in order to fit the hop strainer! 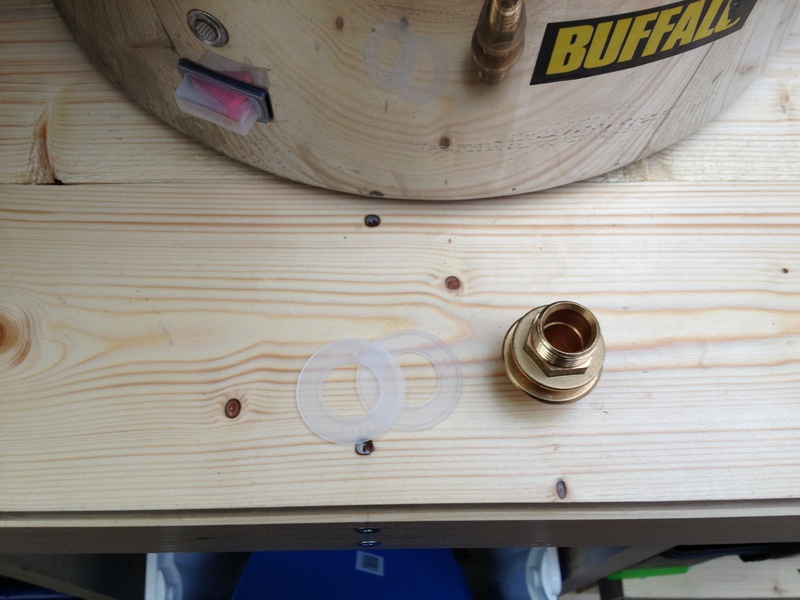 Next, take your Tank Coupling and a pair of washers and insert it through the now enlarged hole. 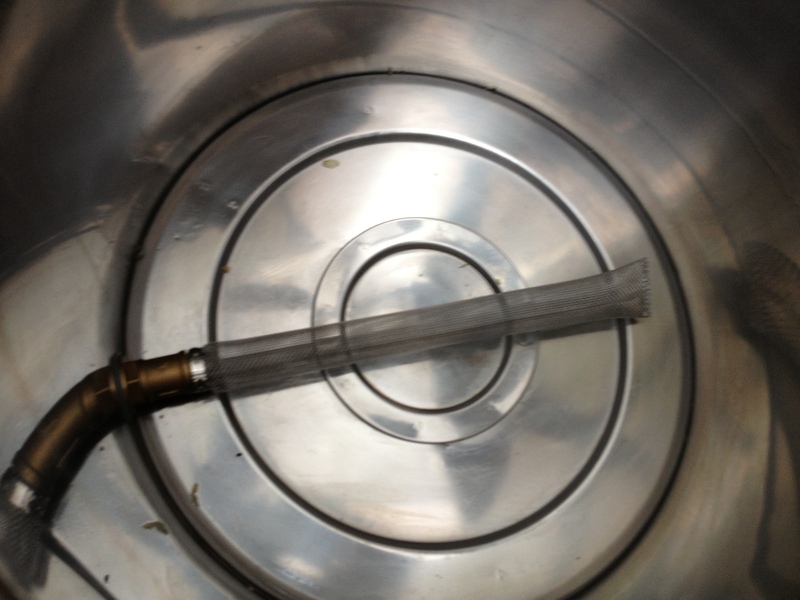 Remember to add some PTFE tape at this point as you tighten this (like I didn’t) as the water, or worse still, the beer will leak from the boiler along the thread of the screw! These were then tightened with a pair of spanners to ensure a good solid fit! 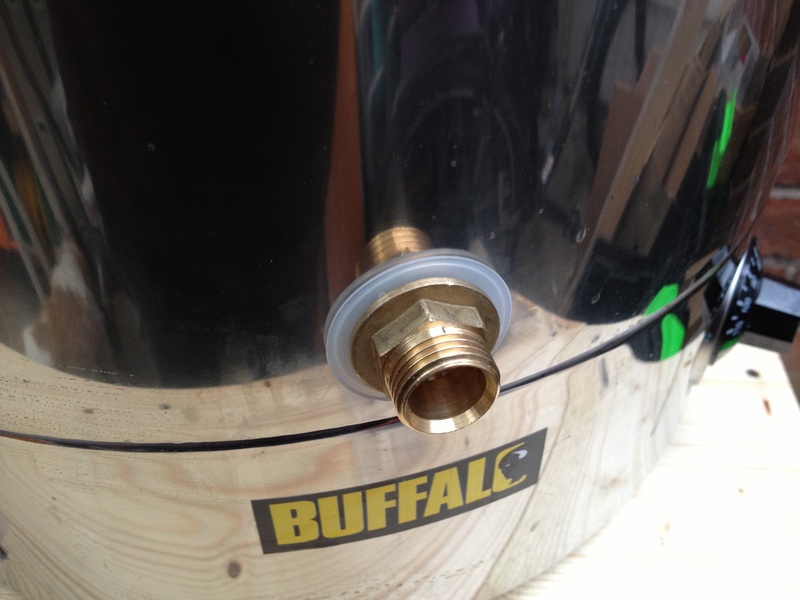 The Ball valve and Hop filter both simply screwed on to the Tank coupling, along with some more PTFE tape, and were tightened with a spanner. Raising the height of the hole by 2mm worked well as the Hop filter can be easily unscrewed and removed to aid cleaning the element plate of the boiler. Finally a Hose connecter was screwed onto the outside of the Ball valve, with some more PTFE tape. Food-grade silicon hosing then just slips onto the connector and helps guide the liquid to the next stage of the brewery with minimal fuss or splashing! The whole process was then repeated on my second boiler (the HLT) without the addition of another hop filter as that would only be holding water. All in all, (excluding the time it took me to undo and redo the Tank Coupling to add PTFE tape) each boiler took perhaps 20 minutes to complete, and was relatively straight forward even for a novice like me! Most importantly it hasn’t leaked yet!!! I hope this has been of some use! Now, back to the brewing! Thanks for this, I have ordered all the parts and I shall be converting 3 boilers next week. Have the plastic washers held up OK? Excellent! Thanks for your reply, I’m hoping to build mine this week and get my first brew under my belt. 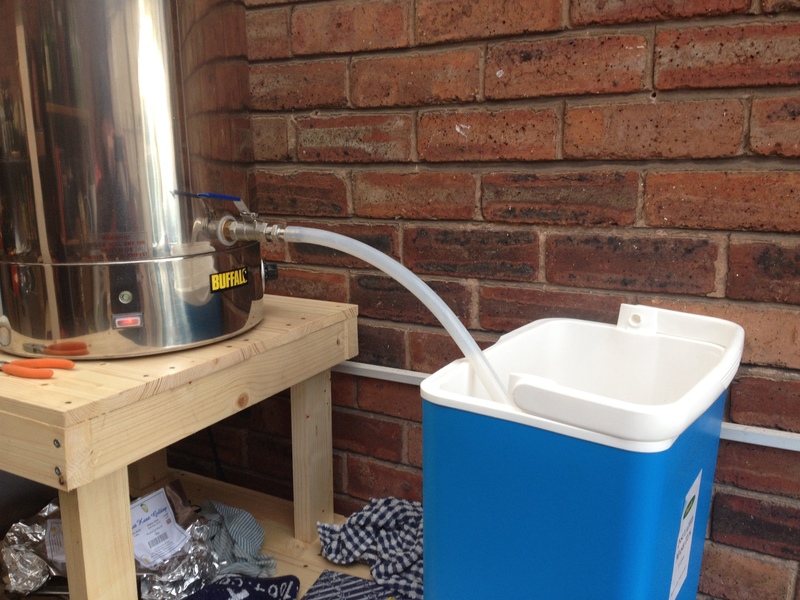 Did you start all grain brewing after you had done some kits or did you jump straight in? I started with three kit beers and two kit wines, but then moved on straight into all grain. 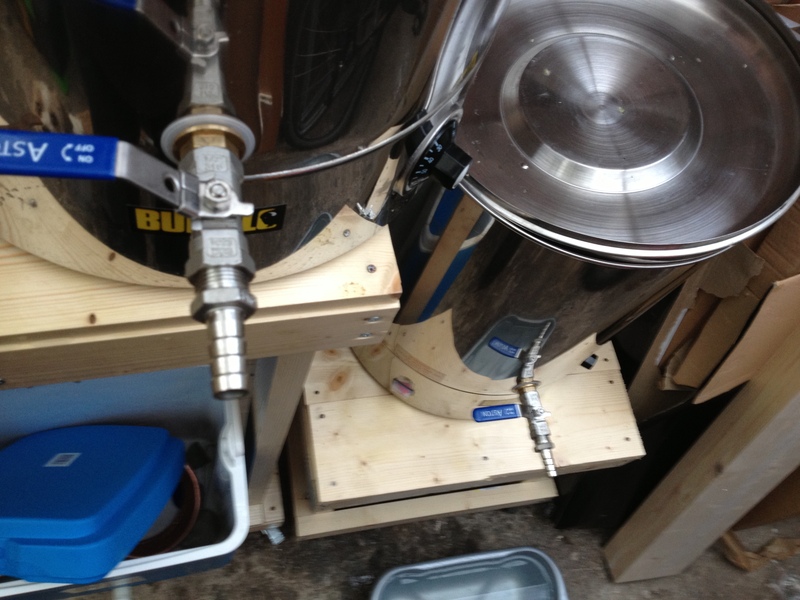 Kits lack the control and ability to tinker with recipes, but they are a decent place to start if you don’t have a lot of space, or don’t want to ‘risk’ the money on setting up an all grain brewery before deciding if it’s really for you! I’ve been kit brewing for about a year now and I’ve loved it, I’ve done 35 brews including all the beers and wines. I dropped on some electric boilers on ebay for £40 each and I couldn’t resist! All my bits arrived today from BES along with a wort chiller, hop filter and false bottom from the homebrew shop. 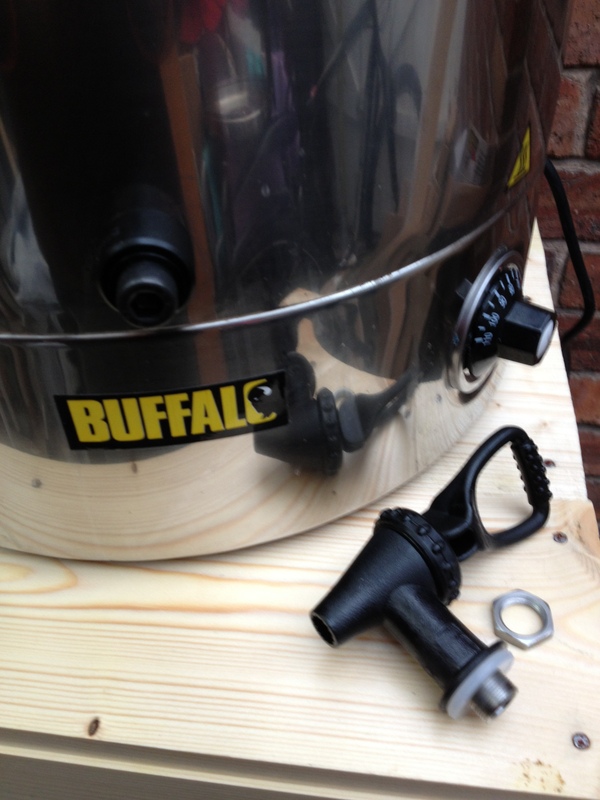 I need to build my brew stand, take delivery of the grain mill shall be embarking on my first AG :-). (Which is a kit but I guessed it would be a good place to start). The site is excellent by the way it’s been very usefull, I shall no doubt be stealing a few of your recipies in the near future! My first AG was a Summer Lightening recipe kit. I figured by going with a pre-designed recipe if it came out rubbish then i’d know it was my fault in the process rather than me just picking a load of malts and hops and making a perfectly technical but horrible beer!